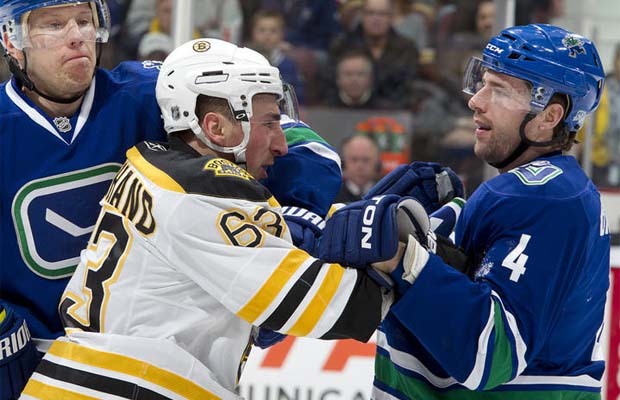 When Vancouver and Boston finally drop the puck on the Stanley Cup Finals Wednesday night at Rogers Arena, it will mark the 50th day since the 2011 playoffs began for the Canucks. It’s been a long road, to be sure. The path has been fraught with highs and lows, and everything in between. Everyone would love to forget the agony of watching Chicago forcing a game seven after Ben Smith’s overtime thriller, but everyone will remember the thrill of seeing Kevin Bieksa’s rolling knuckler trickle past an unsuspecting Antti Niemi in game five versus San Jose. At the end of the day, however, none of that will have mattered if Vancouver gets this far, only to come up short again. Nothing has changed since the Canucks were forecast to claim professional hockey’s richest prize in September; the team has been favourites since the beginning of the season and the club has given their fans no reason to doubt them. And unlike the underdog teams of 1982 and 1994, this time the Canucks will enter the Stanley Cup Finals as the undisputed favourite. Last Time They Met: February 26th, 2011, 3-1 Bruins — Look, the old adage goes that you shouldn’t take much stock from the regular season in regards to the playoffs; and that applies here. The Bruins came away with a 3-1 victory, fueled by a huge effort from hometown hero Milan Lucic, who scored the game-winner with 4:38 left in the third while adding an assist on the empty netter by Patrice Bergeron. There’s a couple things to consider first: The game came just days after the NHL trade deadline, where the Canucks added Maxim Lapierre and Chris Higgins and the Bruins added Tomas Kaberle, Chris Kelly, and Rich Peverley. While Lapierre and Higgins have both played integral roles in the team’s postseason success, Kaberle has predominantly been a mediocre addition, failing to spark a Boston powerplay which has been dormant all playoffs. Kelly and Peverley, however, have been good contributors to the B’s. A lot has changed for both teams since this last clash. The Road to the Finals: Both teams have undergone a similar route to get here; the Canucks and Bruins both needed overtime in game seven of round one to vanquish the Hawks and Habs, respectively, before walking all over the Predators and Flyers in round two. However, Vancouver got even better in round three, completely nullifying the San Jose attack while averaging 3.6 goals in the series. Boston took the long route, needing seven to defeat Tampa Bay, averaging 3 goals a contest. We’re loathe to make series predictions, but we’d still love to hear yours. Chime in with your thoughts on what could be the defining moment for the Vancouver Canucks franchise! Previous story Ranted: Sorry, you can’t afford to buy Finals tickets.